John Stirling was introduced to the club by Past President Trevor Meakin who knew John from his membership of the Officers Mess at Pitreavie Maritime HQ. John had been invited to speak to the club about his experiences in the 1st Gulf War. He gave the club 2 talks each of 40 minutes, fortunately these were several weeks apart. Wing Commander Stirling’s time as an RAF Intelligence officer evading capture in Kuwait by the forces of Saddam Hussain, and the subsequent sell out into captivity by the Foreign and Commonwealth Office sounds like the plot for a future novel. The capture and killing of his Kuwaiti friends who hid him and his family was particularly sad, after John and his cohort of serving forces were told to surrender. As prestige prisoners John and his military friends were well looked after with a view to their future use as collateral in media stunts by Saddam. As we heard more recently in Part 3 of the story Irene and her sons had a more difficult treatment in their repatriation to allied forces. Here it seems the FCO did pull off a coup by fudging passport information to allow John’s sons to be treated as minors and escape imprisonment by Saddam. John later joined the club in 1996. He very quickly gravitated to be a member and then convenor of the entertainments committee. He is well remembered for his vigorous and outspoken cajoling of members to commit to supporting events that were being organised. After several attempts trying to get the club to support events such as dinner dances, he migrated to become the Club President in 2001. John then joined the fundraising committee of which he soon became the convenor. 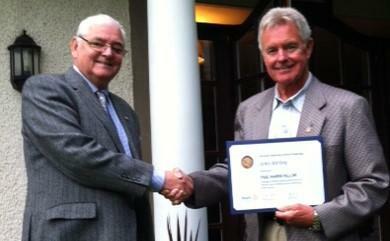 John has now for more than a decade been making a huge contribution to Rotary in leading a successful fundraising team. Without these successes the club would not be able to make its presence felt in the Local and International Community. - The club is very grateful for all the work you have done for us over the years. President Ewan Archibald had great pleasure in presenting John with our greatest honour, that of a Paul Harris Fellowship.